Nigerian-born female boxer, Helen Joseph, popularly known as “The Iron Lady” has challenged her counterparts in the United States to a fight, saying she is ready to knock out her competition. 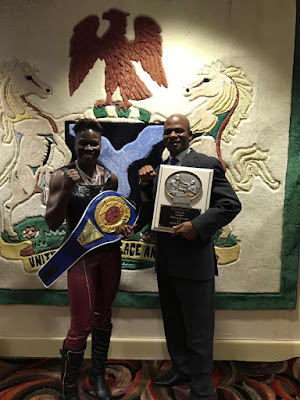 The former IBF champion in the featherweight division said during a courtesy visit to the Nigerian Consul General in New York, Mr Benayaogha Okoyen, that she wanted to put Nigeria on the world female boxing map. She ranks among the top in the world of female boxing and has five weight classes – flyweight 115, bantamweight 118, superbantam 112, featherweight 116 and any other super feather weight 129. “So all these while you have been fighting cheap opponents, now that I have arrived, nobody wants to show face,” Joseph said. “I want my country to watch the kind of action and power God has given me. The fight I want Nigeria to sponsor for me is the World Boxing Organisation. “She is a Champion, she is one of the most feared fighters in the world but she hadn’t had enough promotions. “Right now, Nigeria has incredible top talents in the arts, in sports around the world and she is of that calibre, she’s a top global athlete. “She can do a lot, she wants to represent Nigeria. She’s an incredible personality, she’s not just a talent, she’s got charisma. Everybody needs to know she’s a star,” Shipley said.